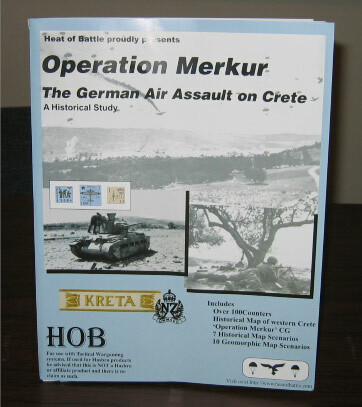 Operation Merkur (OM), a historical ASL module covering the May 1941 German air assault on Crete, is the first historical module from Heat of Battle in six years, a remarkable gap. It follows in the large footprints of its 2002 predecessor, Onslaught to Orsha, which was probably the most popular third party ASL historical module published. The peculiarly titled OM (it should be either Fall Merkur or Operation Mercury, but not one Geman and one English word each) was designed by a new design team for HOB, consisting of British ASLers Shaun Carter and Derek Ward, American ASLer Andrew Hershey, and Danish ASLers Michael Hastrup-Leth and Magnus Hindsberger. The map is credited to Tom Repetti, as well as Hershey, Mike Standbridge, and Don Petros. Though not as large in scope as Orsha, nor quite as meaty, OM is nevertheless a significant package. 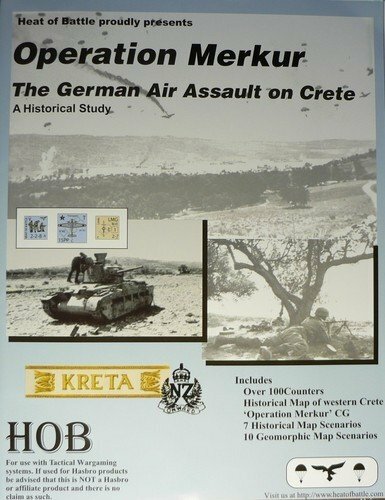 Like its predecessor, it contains two different types of scenarios: geomorphic map scenarios that depict actions from the entire Crete campaign and historical map scenarios that depict actions from the fierce fighting for Maleme airfield that decided the fate of the campaign. 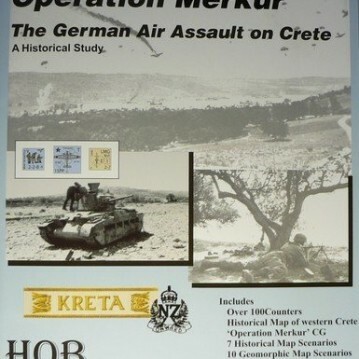 As with Orsha, the two sets of scenarios confusingly have different designations, so the module has scenarios OM1-OM7, the “Operation Merkur” scenarios, which take place on the historical map, as well as scenarios AoC1-AoC10, the “Assault on Crete” scenarios, which use geomorphic maps. OM also differs from Orsha in that the latter offered a traditional ASL HASL campaign game, while OM does not. 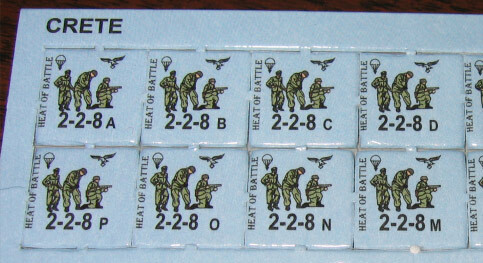 Rather, it offers 5 paragraphs of rules that allow players to play scenarios OM2-OM7 in order, keeping a running total of scores. 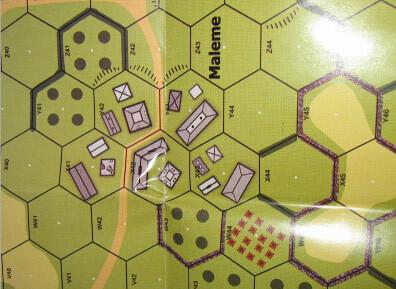 Although the rationale offered for this decision, that the fighting for Maleme did not lend itself to a traditional campaign game format, may well be valid, some players will nevertheless be disappointed at the lack of a true campaign game. It also means that there is somewhat less use for the historical map in OM than in most HASL modules. The large size of the OM map also may exacerbate the map’s primary weakness, which is the paper that it is printed on, a glossy, very thin paper (think of a magazine cover, perhaps). Some ASLers will dislike the glossy aspect of the paper, as it will cause reflective glare in many playing environments, but the more significant issue is the thinness of the paper, which simply does not appear as if it can sustain repeated folding and unfolding. Indeed, Desperation Morale’s copy of the map evidenced visible wear along map folds just through the limited number of folds and unfolds required for initial inspection and perusal, measurement, and taking photographs. 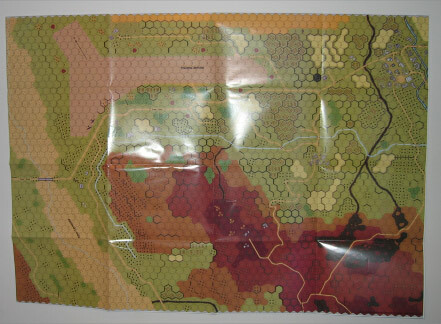 Probably the only way the map can survive sustained use without damage is if the map is laminated. Even playing under plexiglass may not be an adequate solution, because the map still needs to be folded and unfolded each time it is used. Ostensibly, the paper used by the printer was not that intended by HoB (but HoB still shipped the game with it). Leaving aside the physical qualities of the map, the appearance of the map is generally quite attractive. The map is centered on the large hill which dominated Maleme airfield and thus which the Germans had to capture from its New Zealander defenders if their invasion were to succeed. The color palette of the map is bright and attractive (a better, more vibrant palette than Critical Hit historical maps). The graphics are more pleasing than those in Onslaught to Orsha’s map. The OM map is large enough to contain a number of different types of terrain within its borders, mostly rural, so in addition to the hill and the airfield, the map contains a couple of hamlets, some areas of fields and orchards, a (mostly) dry river bed, and more. All in all, the map offers a pleasing amount of variety. However, since only one scenario uses the entire map, players won’t typically experience that variety in the same sitting. The map graphics have two slight drawbacks, both involving size. 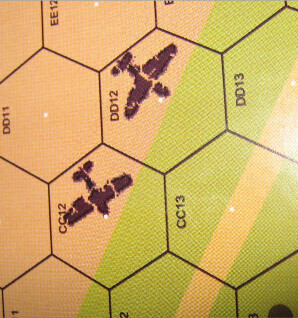 The hexes themselves are smaller than most historical module hexes are, which some ASLers will not appreciate, although it must be noted that the counter density on this map is going to be significantly lower than in games like Red Barricades or Valor of the Guards, so there may well not be a need for larger hexes. In addition, the hex numbers are tiny, which is an inconvenience, though a relatively minor one. Overall, the map graphics are nice. OM also comes with a small (quarter-sized) die-cut countersheet. 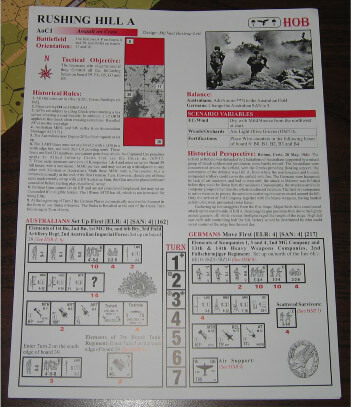 Physically it is similar to that in HoB’s Special Forces pack (and indeed, was printed at the same time). The counters are attractively designed (though a few uncharitable ASLers have complained about the glossy finish on the counters) and the die-cutting was good. 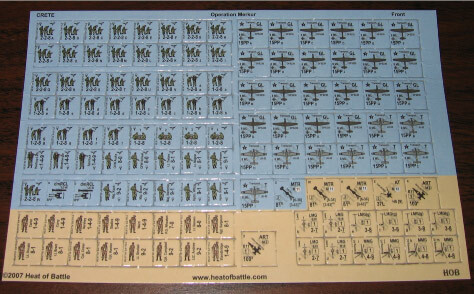 Most of the counters are German, primarily featuring “unarmed” German paratroopers (similar counters were independently created for an issue of the French ASL magazine Le Franc Tireur) and German gliders and transport aircraft. 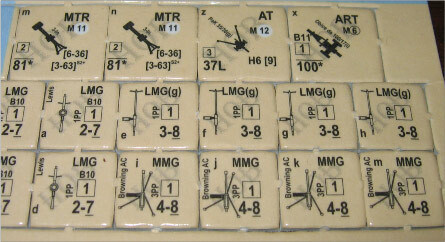 Miscellaneous German counters include a few leaders and heroes, two dismantled recoilless rifle counters, and a captured British 3-inch mortar. The countersheet also includes some British counters, mostly leaders and heroes, but also five artillery pieces and 12 unusual machine guns. The counters are very nicely done. OM is not rules-intensive, in terms of HASL detail. Three pages of rules describe specific terrain types, such as reed beds and river beds; the rules also provide for the exciting prospect of landing JU-52 transports on the airfield under fire. Because there is no true campaign game, there are no lengthy rules for drawing perimeters, purchasing forces, etc. OM comes with a satisfying 17 scenarios. Of these, only 7 use the historical map. 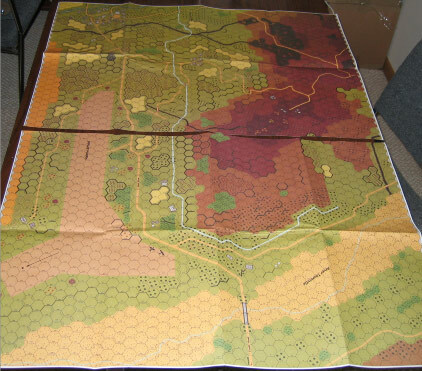 The others use standard geomorphic maps, including one scenario, AoC4 (Town and Country), which uses DASL maps. Of the historical map scenarios, most use only a small portion of the overall map, and only one uses the entire map. 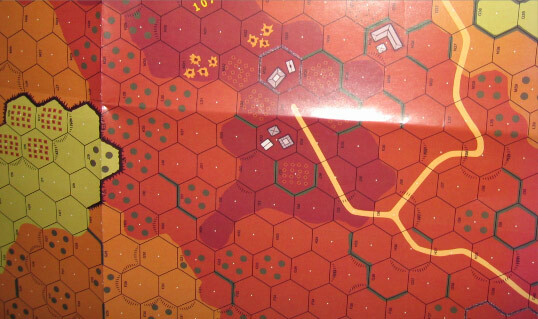 This scenario, OM-7 (Too Little, Too Light), is a 13 turn scenario (with Night rules in effect for turns 1-4) that depicts the last New Zealand counterattack to try to re-take Hill 107. Though it uses the whole map, it has a somewhat more playable number of units than The Last Bid. It features 38 New Zealand and Greek squads (and three tanks) attacking 25 German squads (many of which enter as air landing reinforcements on JU-52 transports) and 5 guns. The scenario mix is a pretty good one, with about an equal number of small/medium sized scenarios and large ones. 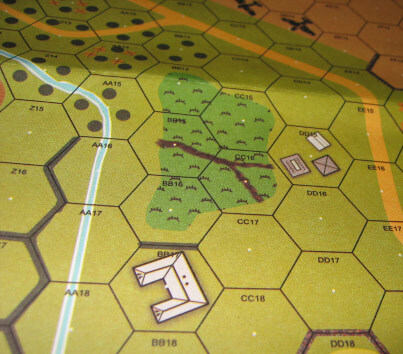 Some of the larger scenarios will play quicker than normal as well, because AFVs rarely make appearances in this largely infantry vs. infantry fight. Because OM does, after all, depict an airborne assault, six of the scenarios feature some sort of air landing or drop, including almost all of the historical map scenarios. Many of the scenarios are rather SSR-intensive (even leaving aside the special OM historical SSRs). One scenario has OBA and two have air support. The scenario cards themselves suffer from sort of computer formatting error which replaced certain characters (such as umlauts, apostrophes, etc.) with other characters, resulting in a number of typos throughout the scenario cards. Proofreading could also have been better (Maleme is even misspelled on the module back cover). Overall, Operation Merkur seems to be a promising release. Many of the scenarios look interesting, and of course, ASLers who like air assault operations will have a field day. Were it not for the flawed map, this product would probably be a mostly unqualified success. 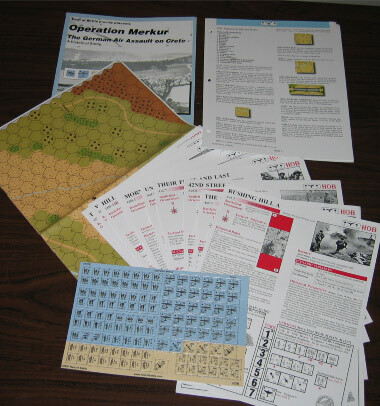 UPDATE Spring 2008: Following the publication of Operation Merkur, negative reaction regarding the map included with the game prompted Heat of Battle to re-print the Operation Merkur map. This new version, first of of all, comes in 2 sections rather than the single ungainly original map. Secondly, the map is no longer printed on thin glossy paper, but rather on thicker non-glossy paper. The result is a considerable improvement over the original map. HOB does not, however, appear to be putting the map into copies of the product but rather only selling it separately (at the hefty price of $21 for a map by itself) as an addition to the module. This means that even using Heat of Battle’s “multi-purpose deal,” it will cost $82 from HOB to get Merkur with the better map (or around $70 from an Internet reseller), not including shipping. That’s a lot of dough. Update 2014: Operation Merkur has not received that much play since its release, which is a shame, as many of the scenarios look interesting. Those who read this should take these words as a sign that it is time to break out your copy and give this a whirl. One of the most underrated HASL products in my opinion.